NEWINGTON, N.H., (March 21, 2019) –SIG SAUER, Inc. congratulates Team SIG professional shooter, and U.S. Army Sergeant First Class, Daniel Horner for multiple first place finishes at the 2019 U.S. Army Small Arms Championship (All Army Championship), hosted by the Army Marksmanship Unit (AMU) held March 10-16th at Fort Benning, Georgia. SFC Horner placed first in the Multi-Gun Competition, National Match Rifle Course of Fire, and was the Overall Individual Match Champion. Horner also competed as a member of the Army Reserves Career Division (ARCD) Team that won the Overall Team Championship. 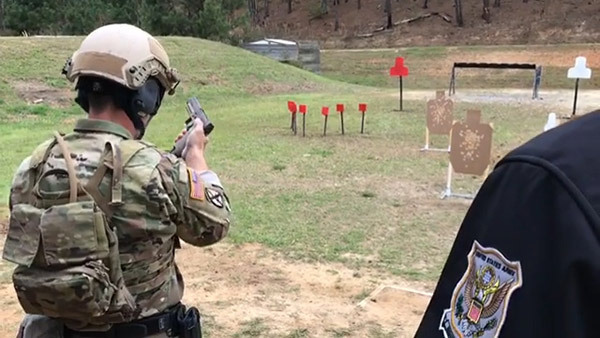 The All Army Championship is week of non-stop, sun-up to sun-down competition of 400 scored rounds using U.S. Army issued equipment, including the U.S. Army’s M17 pistol. The competition is only open to Active Army, Army Reserves, U.S. Army National Guard, Military Academy, College ROTC Cadets, and OCS candidates. Horner is currently enlisted in the U.S. Army Reserves. To claim his multiple first places finishes Horner fired the National Match Course of Fire for both pistol and rifle competition, multiple team and individual matches, and the culminating event of multi-gun competition, designed to simulate combat style shooting on a course of fire that is weighted for both accuracy and speed. Pistol shots were fired at targets from 7-50 yards using the M17 pistol, and rifle shots were fired from 7-500 yards. To learn more about the M17 pistol used by Horner in competition, and view the features of the civilian version of the U.S. Army’s M17 pistol, the P320-M17, visit sigsasuer.com. This entry was posted in competitions and tagged All Army Championship, M17, SFC Daniel Horner, SIG SAUER. Bookmark the permalink.